OHSWEKEN, Ont. 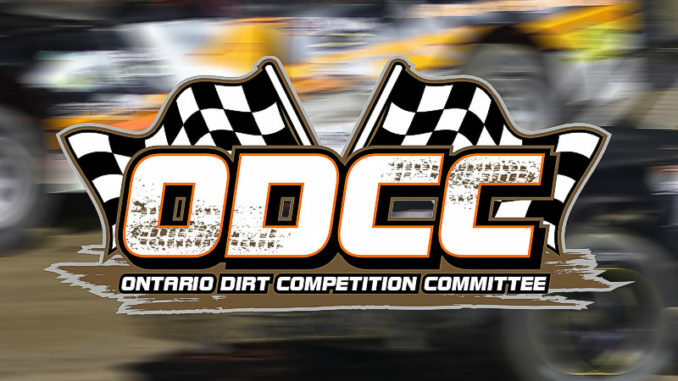 (December 12, 2018) – Five Ontario dirt tracks are pleased to announce the creation of the Ontario Dirt Competition Committee (ODCC). The committee has been created with the intention to govern the rules for both street stock and mini stock-type racecars at five Ontario dirt tracks, including Brighton Speedway in Brighton, Ont., Humberstone Speedway in Port Colborne, Ont., Merrittville Speedway in Thorold, Ont., Ohsweken Speedway in Six Nations, Ont., and South Buxton Raceway in Merlin, Ont. The committee is composed of 15 members for street stocks and 12 members for mini stocks, including the promoter, head tech official and current champion at each track (South Buxton Raceway is not included on the mini stock committee as it does not have a mini stock-type division). The committee will conduct regular conference calls to discuss any pressing issues that may arise throughout the season. The committee also offers drivers and race teams a central place to pose technical questions, make suggestions or requests and to voice concerns. Any technical rule changes that the committee makes will be adopted at all five members tracks at the same time. Drivers will be able to ask questions, make suggestions and voice concerns using an easy-to-use online submission form found on the committee’s new website at www.OntarioDirtComp.com. The committee will begin accepting new questions and suggestions via the online web form beginning on December 15, 2018. The committee is working to clarify current “grey areas” in the existing rule packages that drivers recently brought forward. However, no major rule changes are expected to the current mini stock and thunder stock rule packages ahead of the 2019 season. Any decisions or updates on submitted items will be displayed on the website for public viewing. Finally, the Ontario Dirt Competition Committee rules will be used for the 2019 Insta-Panels Duel on the Dirt Series. Insta-Panels returns as the title sponsor of the Duel on the Dirt Series for the second consecutive season. In 2018, 82 Street Stocks and 60 Mini Stocks competed in the Duel on the Dirt Series across the five member tracks using the combined rules package. “The Duel on the Dirt Series now encompasses five tracks for Street Stocks and four tracks for Mini Stocks and is a great example of both the tracks and drivers benefitting from a common rules package,” Rinaldi added. About the Ontario Dirt Competition Committee: The Ontario Dirt Competition Committee was created to govern the rules for both street stock and mini stock-type racecars at five Ontario dirt tracks, including Brighton Speedway in Brighton, Ont., Humberstone Speedway in Port Colborne, Ont., Merrittville Speedway in Thorold, Ont., Ohsweken Speedway in Six Nations, Ont., and South Buxton Raceway in Merlin, Ont. The committee also offers drivers and race teams a central place to pose technical questions, make suggestions or requests and to voice concerns. For more information, visit www.OntarioDirtComp.com.